Please let us know if you have any questions about these growth charts and calculators or any difficulties in using them. In 2010, the WHO Growth Charts for Canada were released and were recommended as the standard growth charts for all Canadian children, to replace the CDC growths in use since 2000. The formatting of the 2010 charts was the result of a collaborative statement by the Dietitians of Canada, the Canadian Paediatric Society, the College of Family Physicians of Canada, and the Community Health Nurses of Canada. A number of individuals and professional organizations, most notably the Canadian Pediatric Endocrine Group (CPEG), raised three concerns about the new WHO charts. In particular, CPEG felt that the loss of weight-for-age curves from ages 10–19 years in favor of a sole emphasis on the calculation of body-mass index (BMI) made the charts less useful for short-term clinical evaluation of weight gain or loss in growing children. Secondly, the inclusion of curves for the 0.1st and 99.9th centiles in the 2010 charts raised the possibility of some physicians considering these extremes as the “normal range”, possibly delaying referral of children until they reached one of these extremes. Finally, the loss of the number of intermediate-centile (10th, 25th, 75th and 90th) curves on the 2010 charts made it potentially more difficult for clinicians to identify children who were “crossing centiles”. Set 1 uses centiles 3/15/50/85/97 (roughly ?2/?1/0/+1/+2 standard deviations) on all charts and in addition includes the 99.9th centile (+3 SD) on the weight-for-length (0–24 months) and BMI-for-age (2–19 years) charts. Set 2 uses centiles 3/10/25/50/75/90/97 on all charts, substituting the 85th for the 90th centile and retaining the 99.9th centile on the weight-for-length (0–24 months) and BMI-for-age (2–19 years) charts. The 85th centile was used on the weight-for-length and BMI charts to correspond to the cut-off for obesity in adults. English and French versions of both sets of growth charts are freely available for download at www.whogrowthcharts.ca, as well as instructions for how they should be printed. For those individuals and electronic health-records companies wishing access to the LMS data used to plot the charts, these are available on the CPEG website here. BC Children’s Hospital has now printed and integrated the use of the Set 2 consensus charts. We encourage all clinicians and public-health clinics seeing children in BC to switch to the revised WHO Growth Charts for Canada, and measures are underway through the BC Ministry of Health to ensure that this occurs on the public-health side as well. See also our Anthropometric Calculators (tab above) for determining percentiles and Z-scores for the WHO Growth Charts for Canada, in addition to the CDC Growth Charts and a number of common syndromes. Also take a look at the browser-based Growth Chart Plotter App (tab above) for plotting heights and weights for boys and girls ages 2 to 19 years, ideal for making growth charts for PowerPoint presentations.? A number of resources are available on this website and that of the Canadian Pediatric Endocrine Group to assist clinicians in calculating Z-scores and centiles for anthropometric data for healthy children, children with syndromes, and premature infants. The BCCH Anthropometric Calculators can calculate Z-scores and centiles for height/length, weight, head circumference, body-mass index, waist circumference, waist/height ratio, BMI, blood pressure (2004 NHBLI and 2017 AAP), and height velocity for normal children and for children with selected syndromes, based on published norms. Please note that for weight-based measures (weight, body-mass index, weight-for-length, weight-for-height, waist circumference and waist-height ratio), values for percentiles <0.1st or >99.9th and Z-scores <–3 or >+3 are not reported, because of the non-normal distribution of weight and waist circumference in children. These workbooks are free and do not contain macros. They may be used online or downloaded and saved to your hard drive or mobile device. Anthropometric Calculator for normal children 0–19 years of age (current version: 2019/01/22), based on the World Health Organization (WHO) Growth Charts for Canada (2014 revision). Also contains calculators for waist circumference, waist/height ratio, height velocity, blood pressure (2004 NHLBI and 2017 AAP), predicted adult height from bone age, waist circumference and head circumference. Please also note that the WHO has also made available its free Anthro and AnthroPlus software to do these calculations in these two age groups, respectively. Anthropometric Calculator for normal children 0–20 years of age (current version: 2019/01/22), based on the US Centers for Disease Control and Prevention (CDC) 2000 growth charts (available online at http://www.cdc.gov/growthcharts/). Also contains calculators for waist circumference, waist/height ratio, blood pressure (2004 NHLBI and 2017 AAP), height velocity, predicted adult height from bone age, waist circumference and head circumference. Please also note that the CDC has made available a nutrition module in its free Epi Info? software to do these calculations. Anthropometric Calculator for children with Turner, Noonan, Russell–Silver, Prader–Willi, and Down syndromes (current version: 2018/12/28), based on various published norms (references in workbook). 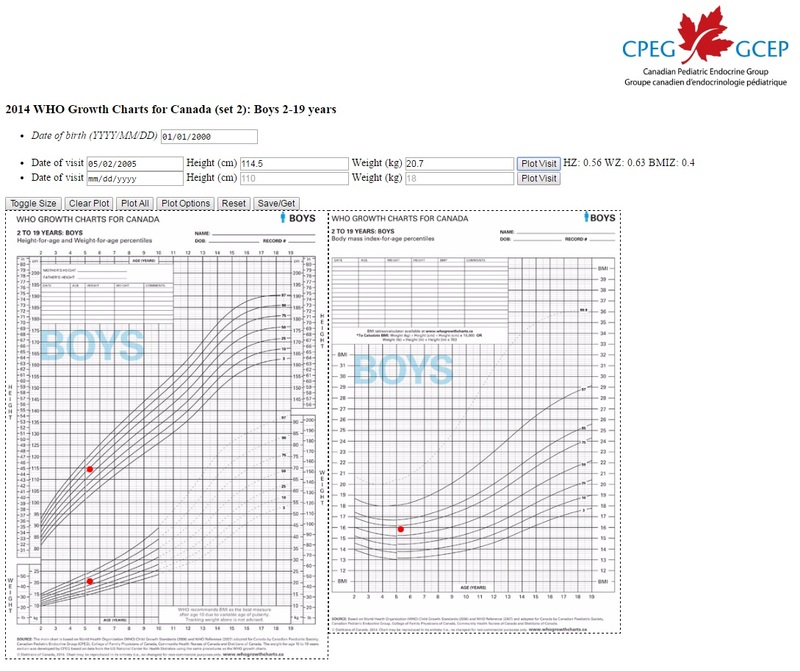 The calculator for the Canadian Pediatric Endocrine Group (CPEG) growth charts has been incorporated into the WHO calculator, following the development of consensus growth charts in March 2014. Please also note that the birthweight-by-gestational age calculator has been retired. Instead, please use the Fenton Growth Charts for Preterm Infants (2013). There are also online and downloadable calculators and web apps available for these charts. We also have available Growth-Z (current version 2018/05/22), a Microsoft? Excel workbook–based program that can do batch calculations for WHO and CDC parameters, as well as 2004 NHLBI and 2017 AAP BP. There is a page in this workbook with instructions for use. Please note that this workbook contains macros, which will have to be enabled for this to work. Please also note that this workbook and the desired anthropometric calculator(s) must be placed in the samer folder on your computer. There are problems reported using this with Macs that we have been unable to resolve. Our AnthroCalc app is available on Google Play. The AnthroCalc app calculates centiles and Z-scores for height, weight, body-mass index, waist circumference, head circumference, and height velocity for normal children (using WHO or CDC references); for blood pressure (using NIH 2004 or AAP 2017 references); for children with a number of syndromes (Turner, Down, Prader–Willi, Russell–Silver and Noonan); and for preterm infants (Fenton, INTERGROWTH-21st). The Canadian Pediatric Endocrine Group has developed macros (using R) for WHO and CDC growth, waist circumference and preterm growth, available here on their website. There is also an option for those wanting to use these CPEG macros in either a clinical or research context, but who are uncomfortable with a statistical package. The Canadian Pediatric Endocrine Group has created on-line applications (Zapps?) running these macros on an R server (a/k/a Shiny), available here on their website. Dr. Atul Sharma, MD, MSc, FRCPC, Assistant Professor, Department of Pediatrics and Child Health, University of Manitoba, has developed a web-based height-, weight- and BMI-plotting app for children from birth to age 19 years, using the WHO Growth Charts for Canada, 2014 revision. The app can be used to make images of plots for presentations (see screenshot below). Plotters for Set 1 and French versions are also available. Our GrowthPlot app is available on Google Play. The GrowthPlot app plots length, weight, head circumference and weight-for-length for children from birth to 24 months of age; and it plots height, weight and body-mass index for children ages 2 to 19 years. Plots are made using the WHO Growth Charts for Canada, March 2014 revision. You can share the growth charts generated by this app as PNG image files via e-mail or text, suitable for use in publications or presentations.